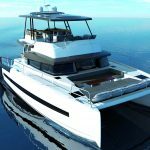 BALI CATAMARANS is about to release the BALI 4.3 Motor Yacht in March 2019, an almost complete overhaul of the initial prototype released three years ago. “Everything has been revisited… from the choice of colours to the choice of materials. We focused in particular on the overall ergonomics of the BALI 4.3 MY with the use of sofas for greater comfort instead of the usual sailboat bench seats and a revised interior helm station to improve the field of vision,” says Yann Chabaud. A completely new visual signature with a redesigned coachroof and hulls optimized for navigating very much in a “Motor Yacht” spirit. 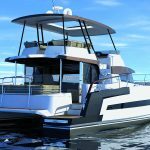 As an innovative brand, BALI CATAMARANS had to meet the growing BALI MOTOR YACHT demand, by bringing to it the BALI CATAMARANS concept and innovations. “One of our close competitors is making significant sales in this sector… We’d be wrong not to be interested in it,” says Yann Chabaud. The BALI 4.3 MY is not like any other model currently available on the market. Like our sailboats, it features the famous “tilting and pivoting” door which is the hallmark all our models as well as the spacious forward cockpit and the aft bridge deck. Yann Chabaud, how long have you been part of the Catana Shipyard team? 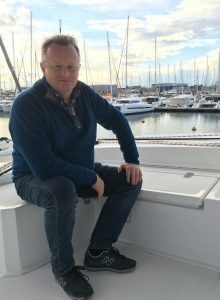 “I joined the Catana Shipyard team 5 years ago, developing the BALI CATAMARANS concept, but I had already been part of Olivier Poncin’s team 25 years ago at Dufour. At his side, I was involved in developing nearly 40 models, including the first Nautitech models that are at the origin of the current Rochefort-based shipyard”. Tell us about your passion for boats? And finally Yann, what does the BALI CATAMARANS brand represent for you? In my opinion, the BALI CATAMARANS brand, with its “Open” concept, is the logical and essential evolution of the “comfort-oriented” leisure catamaran.